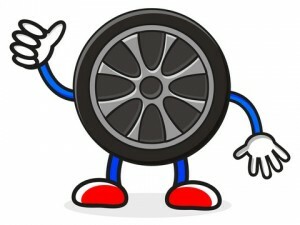 Proper tire care and maintenance is a vital part of car care as well as a safety issue. But it’s sometimes the last thing we think of when we’re driving unless we have a flat. These days keeping your car going those extra miles means keeping an eye on your tires. Air pressure: Measured in pounds per square inch, also known as PSI. Under-inflating tires can result in reduced mileage and shorter tire life. Heed the recommendations on the side of the tire and keep your PSI within 5-10 pounds of this. Balance: Keeping your tires balanced prolongs the life of the tire as well as improves your gas mileage. Tread: Good tread not only makes a safer tire it also decreases the rolling resistance that increases fuel economy. Proper tire maintenance keeps your car on the road. Rotation: Front tires wear out almost twice as fast as rear tires on a front-wheel drive vehicle so rotate every 7500 miles or more often for high performance tires. Valve stems: Loss of air pressure is the number one factor in reduced tire life. When tire valves begin to weather and crack, and/or when valve caps are missing, air seepage is likely to occur. Tire valves should be replaced whenever you purchase new tubeless tires. So when should you get new tires? Check them the old fashioned way, with a penny. Insert Mr. Lincoln headfirst into a groove in the tread. If any part of his head is covered you’ve got good tread. If you see the top of his noggin or above it’s time to visit Sallas Auto Repair and get some new tires. We’ll get you rolling again in no time.